Our LGBTQ club were delighted to welcome Carl Austin-Behan, Lord Mayor of Manchester, to discuss some of the key topics in the LGBTQ community. 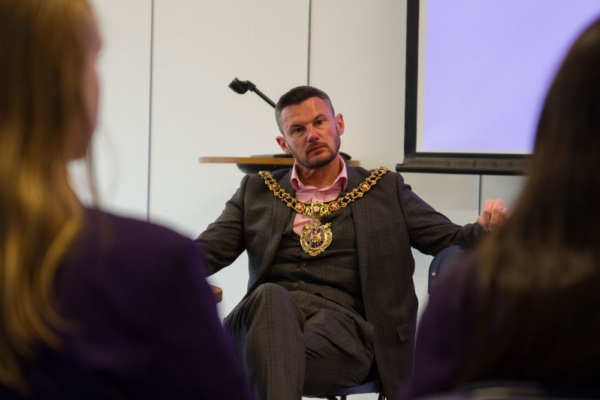 Upon hearing of the work our students were doing in school surrounding LGBTQ, the Mayor was keen to arrange a visit to come in and see the project for himself. An hour of student-led discussions took place, alongside input from their club co-ordinator Mr Webster and Executive Headteacher Ms Patsy Kane OBE MA. It’s the younger people of today that need to educate the older people. They can go away and give advice and support to not only mums and dads, but also their brothers and their cousins who may be going through any sort of sexuality and gender situation. It’s about them being there to support them and I think what you’re doing here is fantastic in the fact that you’re raising awareness but in a nice, light-hearted way that doesn’t make people feel uncomfortable. We would like to thank the Lord Mayor for giving up his time to visit the school and wish him all the best for the rest of his term in office.